Has anyone else had the email about Trafalgar Square yet? Anyone else just had an email from Ticketmaster to enter a ballot for tickets to see U2 performance in Trafalgar Square, London this Saturday? 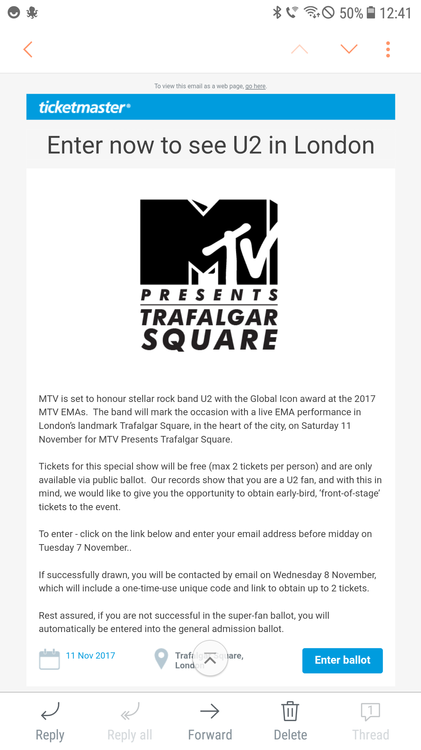 MTV is set to honour stellar rock band U2 with the Global Icon award at the 2017 MTV EMAs. The band will mark the occasion with a live EMA performance in London’s landmark Trafalgar Square, in the heart of the city, on Saturday 11 November for MTV Presents Trafalgar Square. Tickets for this special show will be free (max 2 tickets per person). 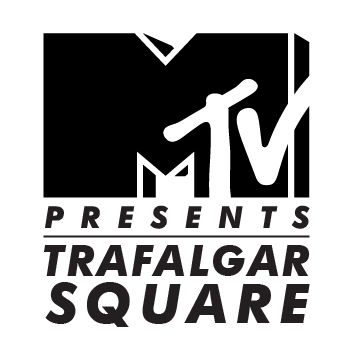 Click on the link below and enter your email address before 10pm on Tuesday 7 November in order to be entered into the MTV Presents Trafalgar Square ticket ballot. If successfully drawn, you will be contacted on an email on Wednesday 8 November, which will include a one-time-use unique code and link to obtain up to 2 show tickets. Guests under 16 must be accompanied by an adult + 18. Please check this box if you require wheelchair access. Yep! I already know i'll be gutted if I dont get to go. Apparently the gig will be about 40 mins long and in front of 7000!! Yes, have entered, not expecting any luck but you never know! Does anyone know what time it's starting? Does anyone know what time it's finishing? Email says collect wristbands before 2pm and to arrive at Trafalgar Square by 3pm. And for U2 to play for 40 minutes. Will subscribers who received the mail be part of a restricted draw or we just joined the rest of the world? It says the draw for subscribers is for up close. Anyone who is not successful will go in a ballot for GA. 70% go to London postcodes, 30% other postcodes. So how do you enter the draw for subscribers? I didn't receive any email about that. And it just had to be on the same day as my own gig in Brighton - on at 4.45 as well! I turned 40 when JT30 was at Twickenham so didn't have a do. My belated do is this weekend ?. Already told my mates I'm bailing if I get tickets. It's all about priorities ? There was an email. I got two, one from U2 and one from Ticketmaster. T&C's say it will cross check email entered against their list and duplicates will be disqualified. So I only entered once even tho 2 emails. So check your spam if paid up subscriber. Says finishes at 10pm. Support starts at 7pm. If DG is on from 9-10 then I'd imagine u2 will be on around 8 or just before with a 40 minute set. I mean Guetta has only got a laptop to set up so not much time sorting that out. I've missed where it says DG on from 9-10. So he's definitely on after U2?